The Ministry of Agriculture, Food and Rural Affairs in South Korea has confirmed that fipronil insecticide was found in some eggs at a farm in the city of Namyangju on Monday. Million of eggs have been destroyed and removed from stores since the contaminated eggs were discovered in Belgium, the Netherlands, France and other European countries. 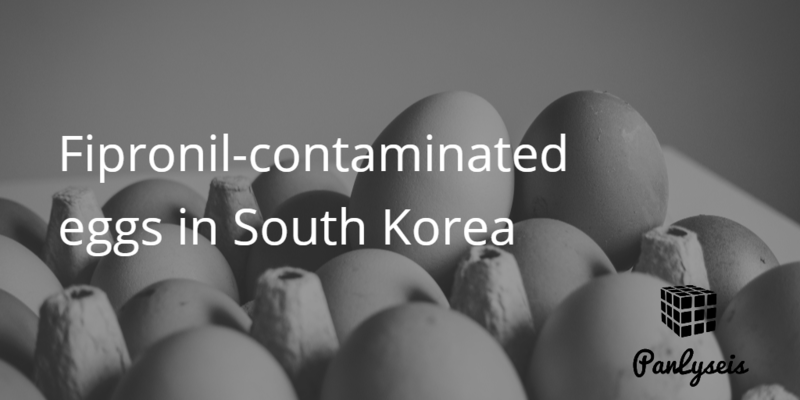 With the widening spread and detection of fipronil contaminated eggs in Hong Kong and now South Korea, it is crucial that food processing companies conduct laboratories tests to ensure that their food supply chain is intact. Fipronil is an insecticide used to control fleas, lice and ants. It is a key ingredient in many pet care products. Fipronil, however, is restricted to be used in environment that processes food meant for human consumption as it is classified by The World Heath Organization (WHO) as hazardous and harmful to the body. Fipronil has been inappropriately used on chicken farms in disinfectant and treatment against lice. European legislation sets the maximum residue limit (MRL) for fipronil in Regulation (EC) No. 396/2005 at 0.005 mg/kg. In the recent eggs contamination cases, fipronil residues have been found breaching the MRL. Panlyseis, together with our partners, have laboratories to perform fipronil testing and analysis. The laboratories can determine fipronil content in eggs as low as 0.003 mg/kg; lower than EU’s maximum residue limit (MRL). This entry was tagged contamination, fipronil, food safety. Bookmark the permalink. ← What’s new in FSSC 22000 version 4.1?